Amazon Great Indian Festival sale begins today and will going to last till November 4. 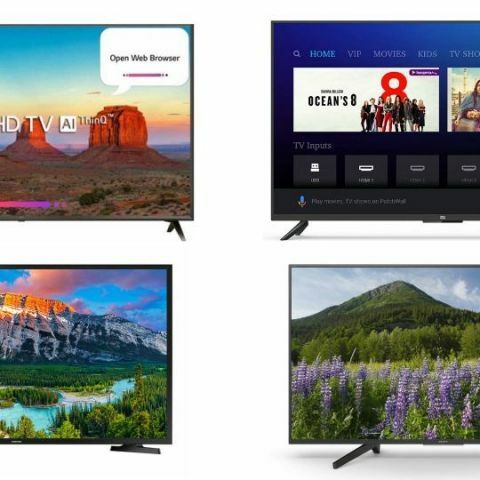 Here’s look at all the best TV deals platform has on its Great Indian Festival sale day 1. Right ahead of Diwali, Amazon kicked off its Great Indian Festival sale that will go on for four days till November 5. The platform has a plenty of discounts and offers on a wide range of gadgets. The e-commerce giant has also partnered with HDFC bank and offering up to 10% discount to those who will make payment through bank’s debit or credit card. Besides that, Amazon is also giving up to 15% cashback to buyers on orders above Rs 5,000. Other than that, those who will purchase on November 2 from Amazon will get a Rs 500 coupon that can be used for booking movie tickets, online food order and more. So, let’s begin. The LG 43-inch 4K Smart LED TV offers a resolution of 3840 x 2160 pixels. The TV comes with a built-in Wi-Fi that allows you to connect the TV to your home network and access apps like Netflix, Youtube and more. It has multiple HDMI and USB ports to connect external devices such as a camera, laptop and more. Interested buyers can also get an instant 10% discount on making payment through HDFC card. View deal here. The Samsung 43-inch 7 Series 4K LED Smart TV offers a resolution of 3840 x 2160 pixels with a panel size of 43-inches. The TV comes with a miracast function that allows you to watch content of your smartphone on a bigger screen. At this sale, it is available for Rs 48,990 down from its MRP of Rs 69,900. View deal here. The Sony 43-inch Bravia 4K LED Smart TV offers four times better resolution than a full HD TV. The TV allows you to see videos and photos of your smartphone on the TV wirelessly. Users can also access Netflix, Sony and more on it via built-in Wi-Fi. View deal here. The Mi LED TV 4A Pro is a full HD smart LED TV that offers a resolution of 1920 x 1080 pixels. As it is a smart TV, one can download and watch content from apps like Hotstar, Voot and more. At this sale, you can get it for as low as Rs 26,998 (appx). View deal here. The CloudWalker 40-inch 4K Ready Smart Full HD LED TV offers a resolution of 1920 x 1080 pixels. The TV is powered by Android 7.1.1 Nougat. It has three HDMI ports and two USB ports to connect multiple external devices. During the sale, you can also get an additional 10% discount on making payment through HDFC card. View deal here. The TCL 55-inch 4K LED Smart TV is now available at the sale for Rs 39,990 down from its MRP of Rs 59,990. The TV offers a resolution of 3840 x 2160 pixels and comes with a panel size of 55-inches. View deal here. The Sanyo 43-inch Certified Android 4K Smart LED TV is powered by Android Oreo 8.0 and comes with smart features like Google voice search, built-in chromecast and more. The TV is equipped with Dolby digital sound system. During the Great Indian Festival sale, you can get the TV for Rs 51,990. As i mentioned earlier as well, buyers will get a 10% HDFC discount and Amazon cashback as well on their purchase during the sale. View deal here. The Samsung 43-inch Full HD On Smart LED TV offers a resolution of 1920 x 1080 pixels. Users can also connect the TV to their home network and access the web based apps. At the sale, it is available for Rs 36,990. View deal here. How to recover accidentally deleted photos and videos from Samsung Galaxy Note 3?